The use of robotic tutors in primary school classrooms is one step closer according to research recently published in the open access journal Frontiers in Computational Neuroscience. Dr Imbernòn Cuadrado and his co-workers at the Department of Artificial Intelligence in Madrid have developed an integrated computational architecture (ARTIE) for use with software applications in schools. "The main goal of our work was to design a system that can detect the emotional state of primary school children interacting with educational software and make pedagogic interventions with a robot tutor that can ultimately improve the learning experience," says Luis Imbernòn Cuadrado. Online educational resources are becoming increasingly common in the classroom, although they have not taken into sufficient account that the learning ability of primary school children is particularly sensitive to their emotional state. This is perhaps where robot tutors can step in to assist teachers. Rather than focusing on specific emotions, the researchers first identified three cognitive states (concentrating, distracted and inactive) known to influence the course of learning. Keyboard strokes and mouse actions of children using educational software were used to predict which of these cognitive states the child is experiencing and subsequently linked to an algorithm that chooses the correct form of pedagogic intervention. These could be words and gestures of encouragement or attempts to raise interest and motivation for a specific learning objective, all of which can be delivered by a robot tutor. 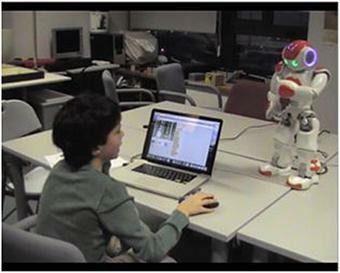 In the Frontiers research article, Dr. Imbernón Cuadrado and co-workers describe an example of a robotic tutor platform, MONICA, which integrates the educational software Scratch to a commercially available robot through the computational architecture developed in their paper. MONICA was tested out on two primary school volunteers known to have different cognitive learning states. Whilst the children enjoyed having a robot guide their learning, and preferred it to working alone, they both felt they would have learned more with their normal teacher, despite feeling more relaxed in the presence of a robot tutor. "Our first prototype was designed to demonstrate that the architecture works in detecting simplified emotional states," says Dr. Imbernón Cuadrado. "The next step will be to implement methods for detecting a more complex range of emotions with cameras and microphones and to test the longer term impact of robot tutors on children's learning curves." It seems however that robot tutors are not ready to replace school teachers just yet. "We consider that robot tutors could have an effective support role to play in the primary school classroom in helping children reach their specific learning objectives," concludes Dr. Imbernón Cuadrado.